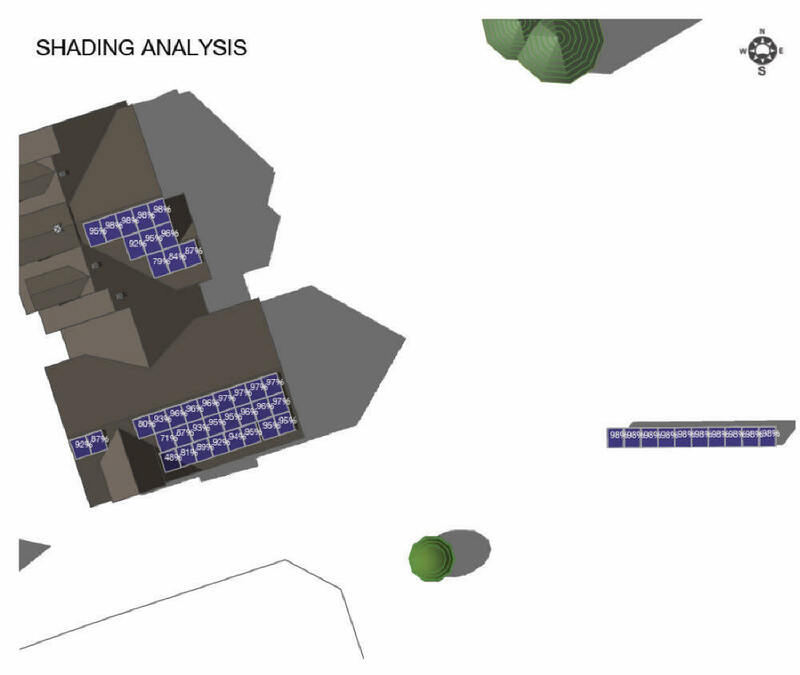 Bright Harvest offers a solar site survey that is based on a model they build of your residence based on aerial photos. The report provides suggestions on where modules might be placed, what sort of shading modules in each position will face, and gives estimates of yearly production. The cost for the report is $150. Mark from Bright Harvest offered to do a report on my house in order to see how it compared with our simple, manual site survey. I took him up on the offer, and this page shows the results. 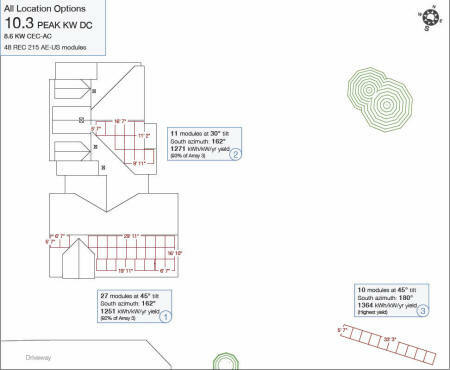 The report shows three potential PV array layouts for my house. One is the ground mounted array that I actually use, and the other two are candidate roof mounted arrays. 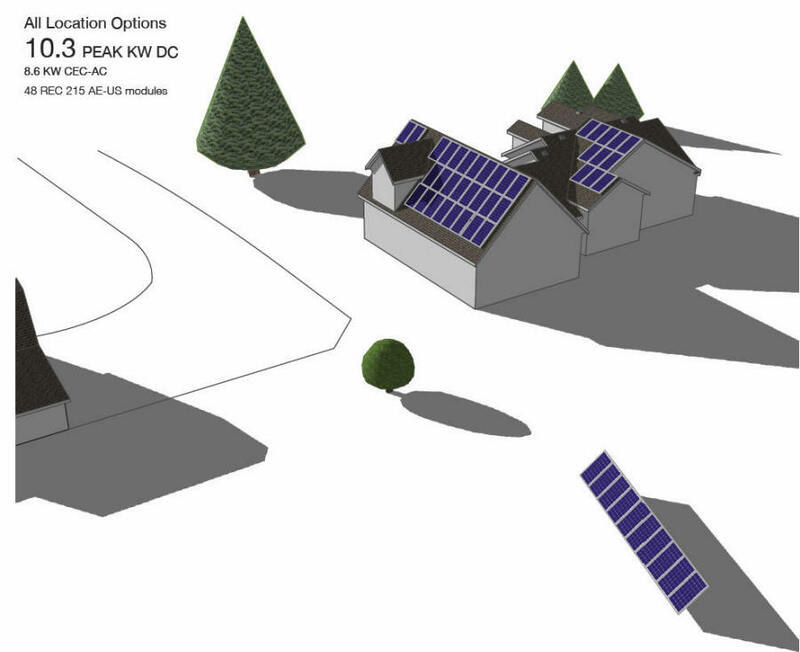 Overview of house model and all three candidate PV arrays. Shading estimates for each panel. Tabular summary including monthly shading estimates and yearly output. - I was impressed by the fact that the report picks up shading due to the mountain range a couple miles to the East. I did not tell them about these mountains, and did not expect the mountains to be considered, but they caught them and modeled them. - I must admit that I had not considered that the dormer on the south roof slope would have a noticeable shading effect. I should certainly have thought about this, but it shows how the report can bring out things that seem pretty obvious in hindsight, but are still easy to miss. - I had not thought about using the south slopping roof on the north end of the house for collectors. I had a few questions on the survey that was done for my house. The questions and answers are listed below. I was satisfied that the responses were complete and made sense. Will the survey typically pick up shading from something like plumbing vents that come up through the roof? Plumbing vents: The bottom line is that small 1.5" - 2" plumbing vents can usually be cut down to 6" high so they're flush with the top of the panels. For larger vents, we recommend maintaining at least a 2:1 ratio (distance to height) from modules. We've looked into ways to simulate the effect of partial shading on system output and the truth is that partial shading effects are too complex to model accurately. Even the industry standard PV modeling programs like PV*Sol and PVSyst (over $1,000 each) cannot do this... and these are the tools used for predicting system output on multi-million dollar projects. NREL did a great study (http://www.nrel.gov/docs/fy09osti/46001.pdf) which attempts to tackle this issue. They point out that in a worst case scenario, partial shade on a module can reduce output by up to 30 times the size of the shaded area but this is not typical or representative. They suggest a value of 2 may be more appropriate. They also acknowledge that looking at a single module or even a single string in isolation is an over-simplification, concluding that further study is needed on systems with multiple strings in parallel. When connected to a string inverter, the non-shaded strings and the inverter affect the functioning of bypass diodes in the partially shaded string and are in turn affected because the shaded string throws off the MPPT algorithm, etc. If a panel is partially shaded, is the output from the un-shaded part counted? How do you handle shading from partial shading objects like deciduous trees? Partial shading: We estimate the effects of partial shading by analyzing 8 points around the perimeter of each PV panel and use only the worst point. If the difference between the worst point and the best point is small, it indicates that the panel is either fully shaded or completely unshaded most of the time, spending little time in a partially shaded state. However, if there's a significant difference between the worst and best point, it indicates the panel is too close to an obstruction such as a dormer, chimney or vent. By using the worst point, we are slightly under-estimating production during the partially shaded time. We then average all the panels in an array together to come up with an array shading average. On a string inverter, this is slightly over-estimating production since the more shaded modules affect the output of the less shaded ones. We've concluded that these two effects tend to cancel each other out. Comparing our estimates to real-world systems has shown that our approach is valid. Deciduous trees: We treat all trees as solid objects for every month of the year. This is an industry standard practice. For example, this is how the Solmetric SunEye handles trees. While it's true that some light gets through between the branches when the leaves are off the tree, this happens during the lowest producing months of the year and typically affects panels early and late in the day. The partial sunlight that does get through is most similar to the worst case partial shading scenario I described above and has a small effect on total annual production. I'm not saying that this is even remotely a big deal as its a very minor amount of shading, but just wondering if: One should expect that maybe very subtle shading might be missed? And, if someone alerts you to look for a hard to spot feature like this, will you try to include it in the survey? I did notice the fence to the east of your array when I first did your report. As it appeared to be maintaining a 2:1 distance from the array, I omitted it. Just out of curiosity, I put it in now and re-ran the numbers. As you can see in the revised report (attached), our algorithm did pick up the fence as evidenced by the two modules closest to the fence dropping from 98% to 97%. When the array is averaged and rounded off to the nearest percent, it still gives a 98% shading derate confirming that the effect from the fence is negligible. I take it that if you do a survey for someone, and they point out that a significant shading item was missed that you would redo the survey for them? If a client is able to provide photos of the site, we can certainly use these to improve the quality and accuracy of the report. In fact, we prefer to have site photos. 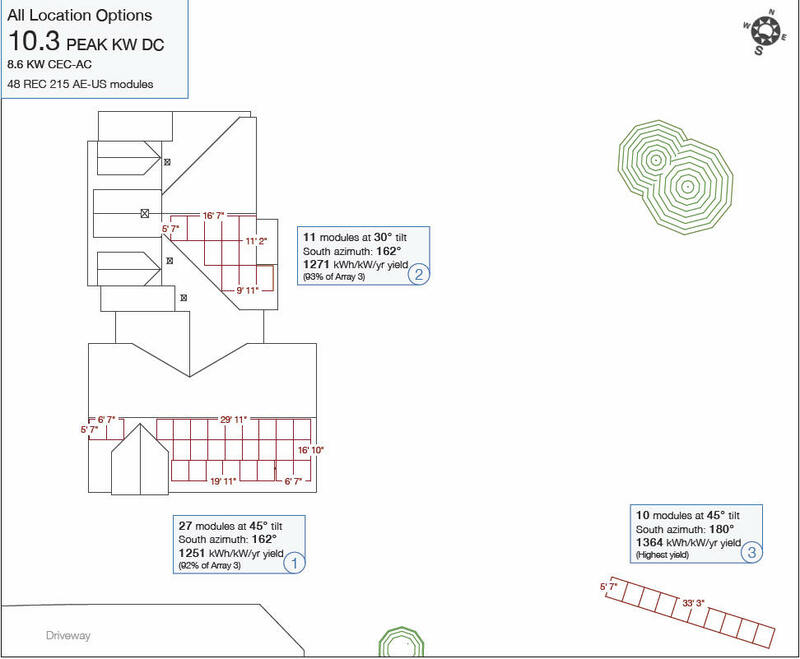 We include one revision in the price of the report and this is typically used to add or remove modules or to show how production would be impacted by the removal of a tree. If we missed a significant shading item, we would redo the report at no charge. I would just like to add that accuracy in production modeling is limited by a number of additional factors. For example, your module's 215W power rating comes with a -/+3% disclaimer. That's a 6% total range and there's no guarantee that your modules will average out to 215W. Conservative modeling practices suggest using the -3% figure for the whole system. The Enphase monitoring data you're using to compare against estimates also comes with a +/- range. Revenue-grade meters typically have to be at least +/-2% but non-revenue grade is typically +/-5%. Enphase doesn't explicitly state this in their manual but they do say that their low-voltage AC cut-off accuracy is +/-4% (pg. 18 of the M190 user manual). The NREL weather data used for the PVWatts simulation comes with a +/-10% disclaimer... and that's a best case scenario, if your weather site happens to be Class I. Class II and III sites have fewer sensors and fewer years of data gathering so they rely on interpolation and have higher uncertainty values. So, we do the best we can with the available data, extract every bit of information from each pixel of aerial image data and in the end the production estimate comes down to an overall accuracy of around +/-10%. I would always recommend that you do our simple manual site survey first. The big advantage of the hand survey is that you will gain a better understanding of how the sun interacts with your house and with the objects around it over all the seasons -- almost everyone finds some things they did not expect. The hand survey will also make you more aware of what the potential shading issues with your house are. If after doing the simple survey, you feel that there are still some uncertain areas, then its certainly worth taking it a step further. Either using the Bright Harvest service, or building a SketchUp model yourself, or whatever is needed to make sure you understand the shading situation well. One example might be the dormer shading on my house, which would be awkward to get a good handle on with the simple survey. Understanding shading is very important -- I get emails quite often from people who are surprised by shading impacts after the modules or collectors are already in place. So, take whatever steps you need to to make sure you have a good handle on shading. There is no question that the Bright Harvest survey adds value -- its just a matter of how the fee for the service fits in your budget. If you do decide to use the Bright Harvest service, I would be sure to think about any particular PV module arrangements you want them to consider, and to alert them to any shading sources that might be missed. Providing them with pictures of your house is also a good idea. I want to make it clear that I don't have any financial or other connection with Bright Harvest. If you do have the survey done on your house, please let me know how it turns out, and whether it was helpful (or not).